(Nanowerk Spotlight) Individual nanoscale building blocks, such as nanoparticles, nanosheets, nanowires or nanotubes display unique and unusually impressive mechanical properties. These mechanical properties of nanomaterials cannot be extrapolated from their bulk properties and scientists are still busily exploring the nanoscale behavior of various materials. Once the nanoscale properties of a material are known, the next problem is how to practically exploit certain properties and transfer them back into a macro structure of a bulk material. Materials engineers would love to transfer the exceptional mechanical properties such as tensile strength and Young's modulus (a measure of stiffness that reflects the resistance of a material to elongation) of nanoscale materials into nanocomposites that then cold be used to build much tougher, lighter and flexible materials than anything we know today – say a paper thin sheet of nanocomposite material that is transparent, flexible, yet as strong as steel. So far, effective load transfer and homogenous dispersion appear to be the key issues in order to take advantage of the extraordinary properties of nanomaterials for mechanical reinforcement applications. New research coming out of the University of Michigan has resulted in nanocomposite materials with a very high content of inorganic component and nearly perfect stress transfer. The stiffness and tensile strength of these multilayer composites are an order of magnitude greater than those of analogous nanocomposites at a processing temperature that is much lower than those of ceramic or polymer materials with similar characteristics. "Nanoscale building blocks are individually exceptionally strong because they are close to ideal, defect-free materials" Dr. Nicholas A. Kotov explains to Nanowerk. "It is however, difficult to retain these ideal properties in macroscale composites. Bottom-up assembly of a clay/polymer nanocomposite allowed us to prepare a homogeneous, optically transparent material with planar orientation of the alumosilicate nanosheets. A high level of ordering of the nanoscale building blocks combined with dense covalent and hydrogen bonding and stiffening of the polymer chains leads to highly effective load transfer between nanosheets and polymer." Kotov, an Associate Professor in Chemical Engineering at the University of Michigan, in collaboration with the research groups of Ellen Arruda and Tony Waas at UM, found that the mechanical properties that they obtained in their novel nanocomposite material are similar to those in steel, although without ductility. "Nanoparticle-filled polymer composites have mechanical properties that fall far below the expected theoretical and experimentally determined values of the individual building blocks, except at low reinforcement volume fractions" says Kotov. "The deficiency in the properties of the composite is largely related to the difficulty of obtaining well-dispersed large volume fractions of the reinforcing nanomaterials and a lack of structural control. The difficulty is also associated with realizing an effective load transfer from the polymeric matrix to the nanoscale components and the insufficiently understood mechanical interactions of the two constituents at the nanoscale." 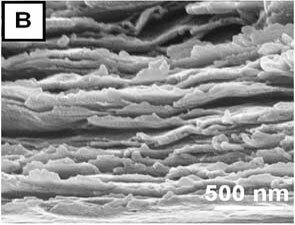 In their recent work, which has been published today (Oct. 5) in Science ("Ultrastrong and Stiff Layered Polymer Nanocomposites") Kotov's team demonstrates that it is possible to produce composites with properties that approach the theoretical maxima using spatial and orientational control of clay platelets in a polymer matrix at the nanoscale and retaining this order at the macroscale. If the problem of transferring nanoscale properties to bulk materials can be solved, very unusual and revolutionary materials could be made. To realize nearly perfect load transfer is probably the hardest problem that materials engineers are facing today. So far, load transfer has been quite ineffective at loadings more than 5-10%. After that the mechanical properties of regular composites actually start degrading with increasing portion of inorganic filler. Kotov's findings indicate that organization of the composite and tuning of molecular interactions between clay and polymer can give almost ideal stress transfer at loadings as high as 50-60%. 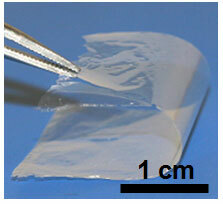 This can be achieved with a technique called layer-by-layer (LBL) assembly, which makes clay sheets to become oriented parallel to the substrate. 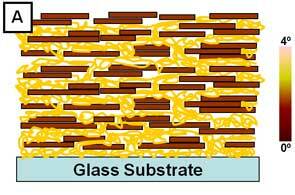 Kotov explains that the LBL process is based on sequential adsorption of nanometer-thick monolayers of oppositely charged compounds (e.g. polyelectrolytes, charged nanoparticles, biological macromolecules, etc.) to form a multilayered structure with nanometer-level control over the architecture. Kotov points out that all polymer chains poorly bound to clay sheet are removed during their LBL assembly process. This all together results in a example of a new class of clay nanocomposites with unique mechanical properties. The University of Michigan team's nanocomposites combine strength, stiffness, transparency, low processing temperature, and flame resistance. "We solved the problem of load transfer quite well for clay sheets" says Kotov. "This is very encouraging. Potentially it can be solved for carbon nanotubes and other nanostructures as well." Specific applications for these clay composites are, of course, in military vehicles but also in aerospace and the automotive industry. Basically, these materials could be considered for components in unmanned aerial vehicles and electronic devices that are exposed to extreme performance conditions. "The future directions of this research will be increasing not only the strength and stiffness but also the strain of the composites, which will yield the toughness" says Kotov. "Having high strains would truly result in 'plastic steel.' We are also working on the better understanding the nanomechanics of these materials.